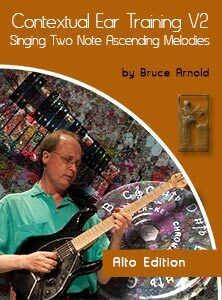 Contextual Ear Training Volume Two Voice continues the series with the singing of two notes ascending. The exercises found in this course are again similar to the exercises found in the Fanatic’s Guide to Ear Training and Sight Singing. The main difference is you can do the exercises found in Contextual Ear Training anywhere that you can listen to an MP3 player, which is just about anywhere, whereas the exercises in the Fanatic’s Guide require you have your instrument on hand to check your answer. Below is an example track from the Soprano Edition of this series. This Level One track plays you a B Major cadence then asks you to sing a root and 4th. Below is an example track from the Soprano Edition of this series. This Level Two track plays you a D major cadence then asks you to sing a Flat 5 and 6th. Below is an example track from the Soprano Edition of this series. This Level Three track plays you a F Major cadence then asks you to sing the 3rd and 5th. Below is an example track from the Alto Edition of this series. This Level One track plays you a C Major cadence then asks you to sing the 6th up to the Flatted 2nd. Below is an example track from the Alto Edition of this series. This Level Two track plays you an E Major cadence then asks you to sing a the flat 5 to 6th. Below is an example track from the Alto Edition of this series. This Level Three track plays you an G Major cadence then asks you to sing a Flat 6th to Flat 7th. Below is an example track from the Tenor Edition of this series. This Level One track plays you a A Major cadence then asks you to sing the Flat 2 to fifth. Below is an example track from the Tenor Edition of this series. This Level Two track plays you a A Major cadence then asks you to sing the flat 7 to flat 2. Below is an example track from the Tenor Edition of this series. This Level Three track plays you a C Major cadence then asks you to sing a 3rd to lat 7th. This two note series not only improves my singing skills but helps my music theory recognition of degrees within a key center. I love the vocal aspect of this series it’s a pleasure to hear the beautiful voices and it is a very soothing way to improve my ear training skills. Buy The Contextual Ear Training Series and then contact Mr. Arnold with a detailed explanation of your level and goals. This entry was posted in Ear Training and tagged ear training lessons online, contextual ear training, bruce arnold ear training, aural comprehension, aural skills, ear trainer, ear training tools, big ears, ear mastery, ear training exercise, ear training tutor, ear training, aural training by Muse Eek. Bookmark the permalink.